Fun & Inexpensive, save the date wedding magnets are an excellent way to announce your special day. 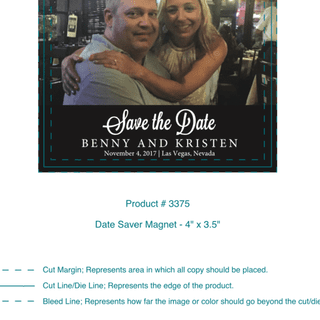 Guests will love seeing an engagement photo in vivid full color along with important date information they can keep handy on the fridge. .036" thick magnet stocks are available at an additional charge. Please speak with a dedicated account manager for details and pricing. I absolutely love our save the date magnets. It is very unique and a great reminder for our guests. It was very easy to order and I got the order rather quickly. I would definitely recommend this company and their products. Hi Kristen, thanks for the positive review and for the photo! We are so glad you're pleased with your save the date magnets. Congratulations on your big day! If you need anything else, we'd be happy to serve you! Thanks again!